The genius of Tony Price’s sculpture was to turn the power of the beast back on itself. With grace and wit and brilliance he fashioned the forms of nuclear destruction into icons of peace in an eloquent appeal for sanity and survival. went on display in the South Gallery of the Visitors Lobby at the UN. This epic undertaking was made possible by the generous support of numerous individuals and organizations. 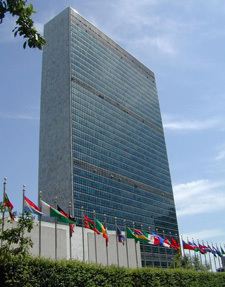 The Friends of Tony Price spent 2004 in discussions with the UN and sponsoring countries before obtainig final approval. Future plans for a permanent facility, traveling exhibitions, publications, and related projects are being planned.